A secondary surface for dedicated or single use opeartion positions. Features height adjustable surface via extension and retraction of the inner leg tube and locks in position with knob activated pressure fit screws. 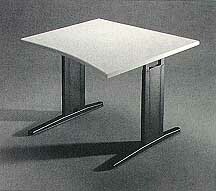 Rule on side of leg table. Surface Length 36" 36" 48" 48" 60" 60"
Height Range 25" - 39" 25" - 39" 25" - 39" 25" - 39" 25" - 39" 25" - 39"